Who are the first at making steel drums out of food packages and drink cartons for arts and crafts? We are at KKC and we are going to show you how to make gleaming pans to put on a show for your surprised parents. You will need an empty juice carton. Give it a wash out and with some sharp scissors, carefully cut out two of the sides. Cut off the top but not the bottom. You should end up with a shape like a slanted roof that will be the steel drum`s base. 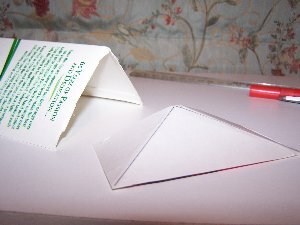 The bottom of the carton is now the shape of a triangle which you can use as a template to make the other end of your base. To do this, use one of the discarded sides and cut out a big enough oblong for the triangle shape. Its length should be the same as the long triangle side and its height the same as the height of the triangle. Use a felt tip to mark your triangle and fold these 2 lines. Now check the picture that you have a triangle with sides that will be used to attach it to the base end. Use a stapler to fix it into place and paper over your base in a paper of your choice. I chose the same color as the steel drum to make it look uniform. 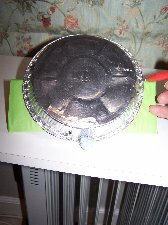 You need a tin foil plate. We got ours from Mr. Kipling tarts. Loved having an excuse to buy and eat 2. It was for a good cause so I`m not suffering any pangs of conscience. We need the plates for our Summer Work Shop you know! Take the plate and use its diameter to mark out where the holes for the legs (aka) 2 skewers or garden sticks. 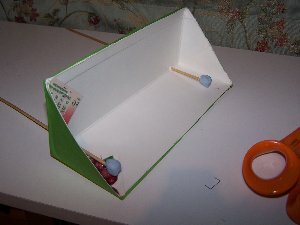 Once you have punched your holes, push the skewers through and put a piece of blue tack on the ends. This will support the base by fixing it to the table top. Put this aside until you make the drum. 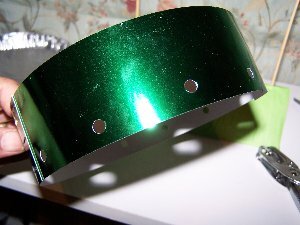 To make the drum, join two lengthwise strips of A4 metallic card together and then use your tin foil plate upside down as a template by wrapping the metallic card strip around inside the lip. This is important so that the pan can fit inside the drum. Hold it in place while you staple it to make a cylinder. See how it looks just like a steel drum! 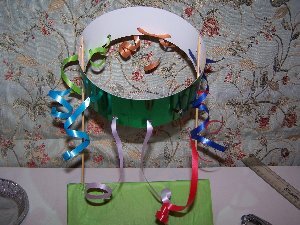 If you want to decorate the drum, punch holes around the edge of the card for ribbons. Now tape the skewers to the inside of the drum on both side to secure. If you want a criss cross design, make some holes around the bottom too. You can decorate it any style you like. Try and think of one. Get your ribbon and weave it between the holes. If you take a spoon and pull the ribbon between your thumb and the spoon, it will curl up like the ribbon in the photo. Weave diagonally from hole to hole, then work the other way to get the criss -cross effect. 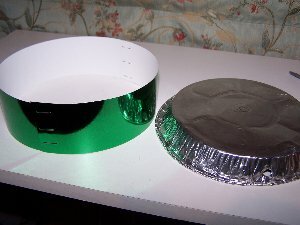 When your finished, sit the tin foil plate on the top of the drum. It should fit snuggling with the lip overlapping the edge. 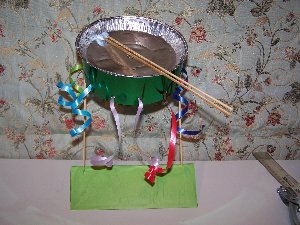 Now get another 2 skewers, put some blue tack on the ends or some large beads for the drum sticks and you have an awesome steel drum kit.